Comparative texts about Pharisees & Sadducees from Josephus, Tosefta, Mishnah & Babylonian Talmud. At (Rutgers University Dept of Religion) Mahlon H. Smith's Into His Own: Perspective on the World of Jesus companion to the historical study of Christian texts. XXXIV.1-3, 5-7; Tatian's Diatessaron (c. 150-160). Chapter XIV, The Martyrdom of Polycarp (ca. 156). II.23, Ecclesiastical History, Eusebius of Caesarea, (c. 320). Twenty-Third Sunday after Trinity, Matthew 22:15-22, Martin Luther, c. 1521. "Render to Caesar," Martin Luther, c. 1522. "The penny was paid to the Romans for tribute, according to the proportion they were rated at, and the drachma was payed by everyone to the Temple, which also the Romans took to themselves when they had subdued India." "Christ did not interpose as a judge in matters of this nature, for his kingdom is not of this world, but he enjoins peaceable subjection to the powers that be." "The current coin of every nation shows who is the supreme governor of it. Render therefore, ye Pharisees, to Cesar the things which ye yourselves acknowledge to be Cesar's: and, ye Herodians, while ye are zealous for Cesar, see that ye render to God the things that are God's." "...and to God the things that are God's--How much is there in this profound but to them startling addition to the maxim, and how incomparable is the whole for fulness, brevity, clearness, weight!" Commentary, Matthew 22:15-22, Erick J. Thompson, Preaching This Week, WorkingPreacher.org, 2017. "“It’s a trap!” This famous line from the third Star Wars movie has become one of my favorite memes, particularly as I live and work in the church." "Loyalties," Karoline Lewis, Dear Working Preacher, 2017. "Ploys to persuade us of power without empathy are everywhere. Cons to convince us that control without compassion are just an encounter away." "Image, Likeness, and Identity," David Lose, in the meantime, 2017. "We were made in the image and likeness of God, and because we bear God's likeness we are to act like God. Not mind you, like gods, those who lord their authority over others for self-gain, but rather like God – the One who creates and sustains and nurtures and redeems and saves…no matter what the cost." Lectionary Greek, Rob Myallis, 2017. "The Image is Everything," "Changing Closed Questions into Open Questions," Todd Weir, With All My Soul, 2017. "Sometimes these days Christians seem a little, well, thin-skinned." "Giving to God the Things That Are (Already) God's," Nancy Rockwell, Dancing with the Word, 2017. "How does how we spend our money, our time, our energy, our resources, our gifts reflect the truth that all of it and all of us have been imprinted with the very image of God?" "Wily Tricks and Tricky Questions," Nancy Rockwell, The Bite in the Apple, 2017. "Since God is honored by many postures: kneeling, sitting, standing, genuflecting, lying prostrate on the floor, and even dancing in the Spirit; it seems odd to say that postures other than standing that honor God insult the flag." "But Everything Belongs to God," Andrew Prior, 2017. "How can I give Caesar what is Caesar's when everything is God’s?" "Show Me the Coin," Oscar A. Rozo, Modern Metanoia, 2017. "In the same way that we are to pay our taxes to Caesar, we are also to pay God by loving our neighbor, by respecting each other, and by forgiving and asking for forgiveness." "Who You Look Like," Lynn Miller, Art & Faith Matters, celebrating our creative and living God by generating art and architecture resources for congregations and individuals. Art and Faith Matters facebook page contains additional resources. "If the coin looks like the emperor, then it belongs to the emperor." A Provocation, Richard Swanson, provokingthegospel, 2017. "So, IS IT allowable to pay tribute, or is it not?" "The Politics of Takiing a Knee," Fritz Wendt, Political Theology Today, 2017. "We will give Caesar what is his, but nothing more; we will give God what is God’s, and that’s everything." "Hypocrisy Exposed," Glenn Monson, Law & Gospel Everywhere, 2017.
" As always we must identify with the ones whom the Word addresses. This means that here we must identify with these self-serving hypocrites." Living by the Word, Debie Thomas, The Christian Century, 2017. "When I read the Gospels, I don’t see a Jesus who ever cares more about the end than the means." Commentary, Matthew 22:15-22, Lance Pepe, Preaching This Week, WorkingPreacher.org, 2014. "Politically, just about the only thing Pharisees and Herodians have in common is that they don't like Jesus." "Whose Image Is Stamped on Your Heart?" Doug Mendenhall, ON Scripture, Odyssey Networks. Video: ON the Street: ON Giving. 2014. "Having Hope," Karoline Lewis, Dear Working Preacher, 2014. "This might be the week to unpack hope for all it's worth." "Money, Politics, & Religion (Oh My!)" David Lose, Dear Partner in Preaching, in the meantime, 2014. "...our deepest self is God's..."
"Clique Clank?" Thomas Beam, 2014. "Knowing that everything belongs to God, we begin rightly." "The Structure of Entrapment," D. Mark Davis, Left Behind and Loving It, 2014. "This question, then, is not unrelated to questions regarding King David and the expectation of a messiah from David's lineage – the topic of Jesus' question to the religious leaders at the end of this chapter." "God and Caesar," Nancy Rockwell, The Bite in the Apple, 2014. "To whom does the common welfare belong?" "Give to God What Is God's," Peter Lockhart, A Different Heresy, 2014. "The first thing we have to understand about this story is that these two groups were not natural allies. The Herodians supported the rule of Herod who cooperated with the Roman rulers and was given authority by them. The Pharisees on the other hand were the legalists among the Jewish leaders who believed that their interpretation of the Law was the one to be obeyed. When they spoke of the law they specifically meant Genesis, Exodus, Leviticus, Numbers and Deuteronomy." Caesar's Due, Bob Cornwall, Ponderings on a Faith Journey, 2014. "In Whose Image?" Christopher Burkett, Preacher Rhetorica, 2014. "Argue Like Jesus," Andrew Prior, 2014. "It All Belongs to God...ALL of It," Janet H. Hunt, Dancing with the Word, 2014. "So what is it that you pray for? Why? Is there anything you think it is inappropriate to pray for? Why or why not?" Jesus’ summary of the Torah that we love of God and neighbor is an important part of director Tate Taylor’s film adaptation of the popular novel The Help. Ed McNulty, Visual Parables. "God, Caesar, and the Power of a Good Question," David Lose, Dear Working Preacher, 2011. "...what if, this Sunday, we reversed that trend and impression by asking people to wrestle with what Jesus says by asking, 'What do you think Jesus means? What things are Caesar's and what are God's? How does our faith shape our economic decisions -- our buying, saving, giving, and the rest?'" Commentary, Matthew 22:15-22, Clayton Schmidt, Preaching This Week, WorkingPreacher.org, 2011. "It is God who claims us, who made us in his own image. We do not belong to anything or to anyone else." "The Heavy Cost of Paying 'The Emperor,'" Matt Skinner, ON Scripture, 2011. "In our increasingly complex existence, Jesus’ statement about attending to “the things that are God’s” prompts us to recognize how all-encompassing that category is. It overshadows the rights and allegiances any empire might demand for itself." Question about Paying Taxes, audio telling, story in episodes, graphic, audio and written commentaries. Go Tell Communications, Biblical Storytelling for the Global Village, 2011. "The Things That Are God's," Fr. Rick Morley, a garden path, 2011. "If we gave to Zeus the things that belonged to Zeus, and to God the things that are God's…what would WE end up giving to Zeus?" Holy Textures, Understanding the Bible in its own time and in ours, Matthew 22:15-22, David Ewart, 2011. "How can a Jew be faithful and observant and also stay alive under Roman rule? Yikes. But it is precisely this position of being caught in a bind of irreconcilable, conflicting obligations and duties that make real life so interesting. The desire to make the tension go away, to solve it, is the enemy of true faithfulness. " Taxes and God, Bob Stuhlmann, Stories from a Priestly Life, 2014. "The Empire Cannot Love You," Russell Rathbun, The Hardest Question, 2011. Comentario del Evangelio por Andrés Albertsen, San Mateo 22:15-22, Working Preacher, 2011. Commentary, Matthew 22:15-22, Jeannine K. Brown, Preaching This Week, WorkingPreacher.org, 2008. "Paying Taxes to Caesar," Gospel Analysis, Sermons from Seattle, Pastor Edward F. Markquart, Grace Lutheran Church, Seattle, Washington. Detailed background and exegesis. "A denarius was part of the Roman monetary system. Many scholars believe that the Roman coins with their images of the emperor on them were not permitted to be used in the Jerusalem temple for offerings." Exegetical Notes by Brian P. Stoffregen at CrossMarks. "We cannot say that "this part belongs to God, so I will give it to God." Everything we are and everything we have belongs to God. Everything we are and everything we have we are to give (back) to God. We are but mere managers or stewards of these gifts God has given to us." 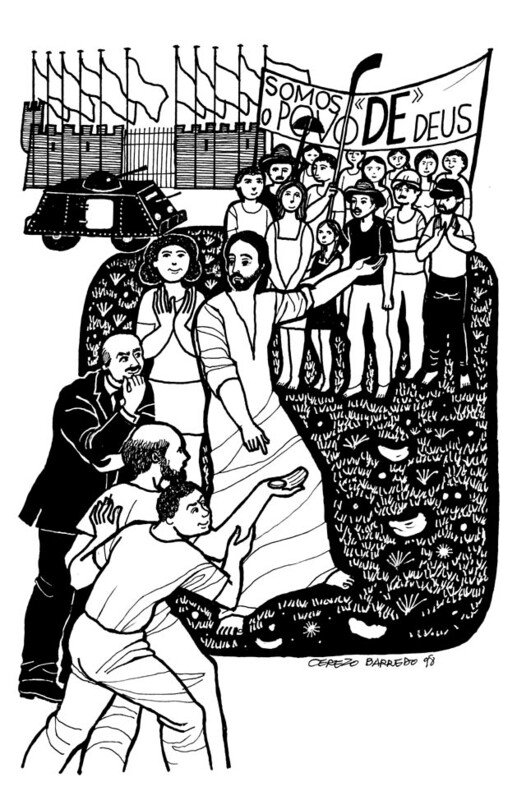 "First Thoughts on Year A Gospel Passages in the Lectionary," Pentecost 19, William Loader, Murdoch University, Uniting Church in Australia. "With this passage we must expose the fallacy of dividing reality into God's area and other areas." Commentary, Matthew 22:15-22, Frederick Douglass Haynes, III, The African American Lectionary, 2008. "This text challenges us to engage the political process, remembering that our ultimate allegiance belongs to God." "Show Me The Money: Unconditional Allegiance to the Unconditioned God," The Journey with Jesus: Notes to Myself, Daniel B. Clendenin, Journey with Jesus Foundation, 2005. "As a friend of mine once observed, civilization is expensive, and taxes pay the tab. But absolute allegiance to an ultimate God, rendering our entire selves to Him without preconditions or limits, without hedging our bets, demands a higher order of magnitude. That takes a lifetime." Dylan's Lectionary Blog, Proper 24. Biblical Scholar Sarah Dylan Breuer looks at readings for the coming Sunday in the lectionary of the Episcopal Church, 2005. "...when Jesus asks the Pharisees and Herodians who are questioning him to produce a denarius in that setting, they do so immediately. In other words, THESE GUYS CARRIED AN IMAGE OF CAESAR INTO GOD'S TEMPLE! And these are the people who were going to teach Jesus a lesson about devotion to God rather than selling out to Caesar if Jesus failed to condemn paying taxes to Rome?" Sermon Preparation Thoughts and Questions by Wesley White, 2005. "May we astonish ourselves in thundering forth, 'Hypocrite!' and be willing to be astonished at the truth when finding it thundered back at ourselves. We need to model both corrective words and corrective actions that build community." "The Question about Paying Taxes," Rev. Bryan Findlayson, Lectionary Bible Studies and Sermons, Pumpkin Cottage Ministry Resources. Includes detailed textual notes. "Conflicting Priorities," Larry Broding's Word-Sunday.Com: A Catholic Resource for This Sunday's Gospel. Adult Study, Children's Story, Family Activity, Support Materials. "Have you ever been trapped by conflicting priorities?" Wellspring of the Gospel, Ordinary 29A, Catherine McElhinney and Kathryn Turner, Weekly Wellsprings. "What Belongs to God?" Marcus Borg, at Beliefnet. "The people identified as Jesus' opponents were not questioning taxes in general. Their question was more specific: 'Is it lawful to pay taxes to Caesar?'" Christian Anarchy: Jesus' Primacy Over the Powers, by Vernard Eller. Full text of book at House Church Central. Donnelly, Doris, "Divine Folly: Being Religious and the Exercise of Humor," Theology Today, 1991. Geisler, Norman L., "A Premillenial View of Law and Government," Bibliotheca Sacra, 1985. Giblin, Charles Homes, "'The Things of God' in the Question concerning Tribute to Caesar (Lk 20:25; Mk 12:17; Mt 22:21)," The Catholic Biblical Quarterly, 1971. Johnson-Siebold, Judith, "Balance Sheet," The Christian Century, 2005. Jones, Susan Pendleton, "Pledging Allegiance," The Christian Century, 1999. "You're Gonna Have to Serve Somebody," Eric Shafter, Day 1, 2017. "Whose Coin Is It?" the Rev. Dr. Ruth Hamilton, Day 1, 2014. "'What God Has Put Asunder, Let No Man Join Together!" The Rev. Dr. William L. Self, Day 1, 2006. "God and Caesar, Then and Now," Dr. N.T. Wright, Lecture - Jubilee Reflections at Westminster Abbey. "Who Gets What!" 22 Pentecost - 16 October 2005, Walter W. Harms, Göttinger Predigten im Internet: Every Sunday Sermons based on the RCL by a team of Lutheran theologians/ pastors. "Paying Taxes to Caesar," Sermons from Seattle, Pastor Edward F. Markquart, Grace Lutheran Church, Seattle, Washington. "Nansemond Shepherd's Rebellion," the Rev. Alex Joiner, Day 1, 1996. "Storypath Lectionary Links: Connecting Children's Literature with our Faith Story," October 19, 2014, Union Presbyterian Seminary. Connections: Exodus 33:12-33 and Images of God For Young Children by Marie-Helene Delval, 1 Thessalonians 1:1-10 and Corduroy Writes a Letter by Alison Inches, Matthew 22:15-22 and Church Harvest Mess-tival by MikeThaler. 2011. Worshiping with Children, Proper 24, Including children in the congregation's worship, using the Revised Common Lectionary, Carolyn C. Brown, 2011. "Kids Pay Taxes, Too!" Charles Kirkpatrick, Sermons4kids.com. "Jesus & the IRS," Jim Kerlin, childrensermons.com. "The People Pay Taxes to Caesar," Sunday School Lessons: Family Bible Study, art projects, music, stories, etc. Mustard Seeds, Proper 24, 2008. A lectionary-based ideas resource for leaders of contemporary worship, Ann Scull, Gippsland, Australia. "For God or For Caesar," from A Certain Jesus by Jose Ignacio and Maria Lopez Vigil. Ideal for catechetical and liturgical dramatization of today's gospel. Claretian Publications. Clip Art Images: Matthew 22:15-21, Misioneros Del Sagrado Corazón en el Perú. Matthew 22:14-21, at Cerezo Barredo's weekly gospel illustration. Liberation emphasis. Is It Lawful to Pay Taxes? is an original hymn by Carolyn Winfrey Gillette on Jesus' teaching of rendering to Caesar and to God (Matthew 22:15-22). Tune: BEACH SPRING 8.7.8.7 D ("God Whose Giving Knows No Ending"). "A Wealth of Words," Brenton Prigge, NewHymn, new, relevant hymn set to traditional tunes.